DEAD CERT. Records is a UK Techno label with previous releases featuring music from artists including Audio Injection / Truncate, Joachim Spieth, Hans Bouffmyhre, Miss Sunshine and Eomac to name but a few. 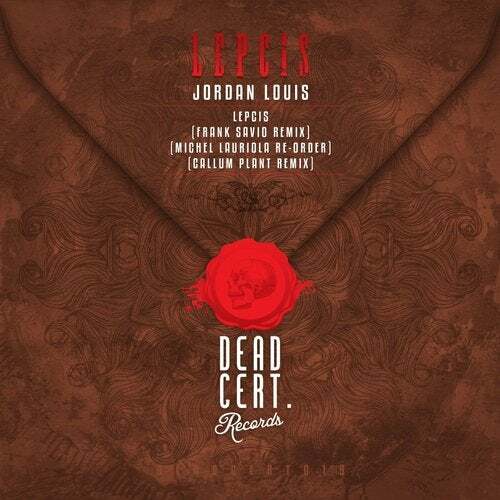 This single release comes from Jordan Louis who is a promising producer from Antwerp in Belgium and this is his debut on DEAD CERT. after releases on Translucent, Audio Borderline and Fach amongst others. His raw talent and ear for creating great tracks is instantly noticeable and will no doubt be appreciated across the board. The original mix of 'Lepcis' is built from a looped lead sound that progresses with flicks of reverb and subtle modulation giving the track an infectiously hypnotic groove. Tailor made for the dance floor, the tracks thick set kick drum pounds like a jack hammer on concrete, whilst fast flowing hi-hats fill the track with undeniable energy. Shimmering like ripples on murky water the track holds an eerie atmosphere thats distinctively captivating and individual. First up on remix duty is Frankfurt/Main based Frank Savio returns with his first remix for DEAD CERT. and a solid history with tracks on with Sutter Cane's Driving Forces, Brood Audio, Harthouse and many more. He chops the originals lead sound into triplets and uses it as more of a rhythm part. Adding his own lead synth that is played on an offbeat stab creates a unique, jerking and powerful groove filled with suspense. The second of the three remixes comes from Venezuelan Michel Lauriola who aside from running 43 Recordings with Alex Bau, has released music on labels including Animal Farm, Different Is Different and DJ Hi-Shock's label Android Muziq. Having picked up recent set lists from people including Rødhåd, Sam Paganini and Kr!z he is a hotly tipped and exciting producer. Michel adds plenty of subtleties and atmospherics to his version, a throbbing sub drives the beat, injecting a darker soul that's perfect for peak time moments. This relentless Re-order will happily power through anything in its way. Last up is Manchester based Callum Plant who is a DEAD CERT. favorite now making his third appearance on the label. With a feisty back catalogue of releases on Ill Bomb, Audio Borderline and Floor Ready he continues to rise through the ranks and impress. Tweaking the hook and lead sound he throws in a rolling bass line which becomes the tracks main focus. He also adds a busy clap rhythm and a high pitched synth part to create a sense of urgency. Filled with forward momentum and hidden energy, the tracks surprisingly laid back break down only creates a false sense of security before things step up a gear.